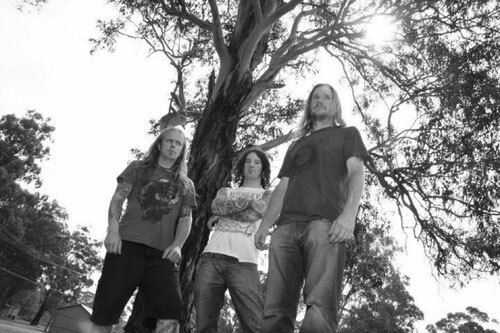 Rising to the cream of the crop of the Sydney stoner rock scene is Arrowhead. Arrowhead – the deadly triangular ammunition of the bow. Or in this case a triumvirate, a brotherhood, a heavy rawkin’ power trio. Whether on stage or recording, Arrowhead is equally explosive. Purveying a powerful blend of infectious riffs and raw, down-tuned grooves, Arrowhead has the proverbial proof in the pudding to soar to the top of the international influx of retro hard rock bands. Having paid their dues in the Sydney pubs, Arrowhead delivers the goods and is poised to garner global attention. Birthed in 2009, Arrowhead has battered listeners with a self-titled EP and a full-length album, Atomsmasher. They have grasped the attention and positive reviews from sites such as Planet Fuzz and Hellride Music. On the live front, Arrowhead has shared the stage with Monster Magnet Earthless, Acid King, Unida, Atomic Bitchwax,Cough and Dave Tice’s Buffalo Revisited. At the forefront of Arrowhead is guitarist/vocalist and main songwriter, Brett Pearl. The obligatory comparison of half Osbourne and half Iommi is there, but Arrowhead do far more than ape the founding fathers of heaviness. No frills, but plenty of thrills. That’s what you can expect from Brett’s 6-string slinging and solid singing. No gimmicks, no trends, just straight-up riffage and vocals that are sure to remind you of the aforementioned Ozzy. Brett is at home whether heaving heavy rhythms or wah-drenched leads. Brett was fortunate to have his mum’s record collection at his fingertips while growing up. Through his hippie-dippy mum, Brett was exposed to a staple diet of die-hard rockers such as Jimi Hendrix, Led Zeppelin, Pink Floyd and mainstays, Black Sabbath. In Brett’s formative playing years he also cut his teeth on more contemporary acts such as Soundgarden, Monster Magnet and Kyuss . Being a tattoo artist, Brett brings with him the experience to illustrate what Arrowhead is all about – visions of space suited chicks with pointy breast plates, Frankenstein monsters, time machines and other quirks of classic B or Z grade horror and science fiction film and literature. Next in line is bassist Dave Lopez, a massive Viking of a muso. Smiling away as he lays down a fat slab of bass guitar. Dave’s low-end grind holds the fort together for Brett to unleash still more fuzzy flurries. Dave is the super glue bridging the gap between Brett’s guitar and Matt Cramp’s mauling and masterful drumming. Dave cites late Blue Cheer bassist Dickie Peterson as a personal fave. The always energetic Matt Cramp is the backbone and arranger of Arrowhead, the man behind the drum skins. Matt’s cranking limbs do far more than just keep time. His furious hands and feet plough through rolls and fills effortlessly. Always returning to the backbeat of the song. Among Matt’s big influences are Thin Lizzy’s Brian Downey, Zeppelin’s John Bonham and Sabbath’s Bill Ward. Any way you slice it, Arrowhead is all killer, no filler. Tunes that conjure up visuals of speeding down a highway in a panel van with a luscious Frank Frazetta-inspired babe airbrushed on the bonnet.